This is itself is unusual, in many adoptive families the difficulties are directed at Mum, as in their lives, our children are usually let down (or at least feel let down more) by their mothers. Therefore the adoptive mother is punished for the birth mother’s difficulties, failings and abandonment. For us, things are a bit different. Anyhow, the NC works in IT, but I can’t be more specific (because I don’t really get it!). He commutes via bicycle, then train, then bicycle the other end too. He leaves he house before 6.30am and gets home around 5.30pm – just in time for us all to eat together. He enjoys cycling and athletics, loathes football, and is a keen aquarist and geocacher. That’s him in a nutshell. The kids both adore him. As do I. In the early days, life was hard for the NC and Mini. There were dark dark days, and one in particular sticks in my mind where I was bawling and on my knees begging him to let us carry on with intros. It was during this short period that he saw his GP and started anti-depressants, and we of course carried on. 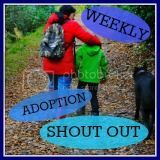 Our case is the reason that our local authority introduced rest-days during adoption introductions, as the NC’s depression was, in part, caused by the sudden, over whelming feelings and the enormity of what was happening. Rest days are now considered vital in order to allow the adopters to reflect, rest, discuss, and be sure about what they’re doing. Mini had never had a male carer in his life and so the NC was a bit different for him. Mini really latched onto him; and rejected me…always wanting his new Daddy. If he cried and I tried to pick him up, he’d end up screaming til the NC came (at which point I’d collapse in a sobbing heap). I could never settle him during the night. I felt like I was a babysitter – just looking after him til Daddy came home. At the time everyone commented on their great relationship… but it was hard for us as the NC was still adjusting to anti-depressants and fatherhood and I felt rejected by my new son. Of course, you don’t instantly love a child when they move in, you have to ‘fake it whilst you make it’ – the NC found this much harder than I, and I’m sure it had an impact on the way their relationship formed. At the time, with support and agreement from Social Services, the NC pulled back when Mini was asking for him, to allow me to step in and become Mini’s primary caregiver and attachment figure. We now suspect this was the wrong thing to do…he clearly wasn’t forming a great relationship with me, perhaps we should have gone with it, and allowed him to settle and feel comfortable with at least one of us? But we can’t rewrite what’s happened. Now, Mini is at his most aggressive when the NC is around. For no apparent reason Mini will approach the NC and hit him and slap him, and the NC doesn’t know how to handle it. It makes him cross, but he knows he can’t respond. So he sits there and just takes it. And takes it. And takes it. Often until I intervene, or until Mini stops and collapses, or until he’s gotten so angry that he shouts. This is not helpful for anyone and we all know that. Sometimes he’ll try to pick Mini up and cuddle him, soothe him, but this frustrates Mini even more and he lashes out even more. The NC has wondered whether we’d be better off as a family if he weren’t here anymore. Which of course, we wouldn’t be – not only would I lose my husband, but Mini would be abandoned by yet another person, and the one that he probably has his strongest bond with. For now, along with other theraplay techniques, we’re using Dan Hughes’ ‘I wonder’ technique and this is helping - though it’s not an instant cure. Mini has managed to tell us what he’s really feeling and thinking on a few occasions. And he’s talked about his feelings towards his daddy which has been insightful. 4 and a half years in, my own relationship with Mini is much much better. There are few signs of those early days left, and Mini will often come to me over daddy. I wouldn’t say he was a daddy’s boy any more, although you can tell he looks up to his daddy so much. He idolises him, he wants to help him, wants to join in with things he’s doing, just wants to be with him. It kind of got me thinking…in the traditional set up (like ours) mum is the one who does most of parenting because dad is out at work. I get most of the difficult times, just because I spend more time with Mini, but I also get most of the good times too. Is it fair that dad has to put up with so much aggression in the short amount of time he has at home? Would Mini still be like this if the NC was at home more? Who is missing out? For many families, having Dad around changes the normal daily dynamic. Mum does the boring routine stuff –getting ready for school, cooking tea, helping with homework/reading. At the weekend Dad comes home and it’s ‘chill out’ time for everyone. That’s when the fun stuff happens. In our house it involves Geocaching, DVDs and popcorn, Lego and marble runs, a trip to the park, going out for a walk, picnics on the floor, playtime in the garden, visiting family (although restricted at the moment to the NC’s parents and sister). Even in the evenings when Dad’s around it’s more exciting than mum – Dad gets to play, splash at bathtime, read stories (with voices!) before bed – yep you’ve guessed it, Dad does the bedtime routine in our house! Would the dynamic change so much if Mini and the NC hadn’t had those early difficulties? Would their relationship be different? More accepting even? What’s it like in your house? Does dad cop the crap? Is mum the peacekeeper? Do you let your partner deal with it in their own way or do you work together with a shared or complementary approach? I look forward to your comments…. Obviously can't do any commenting on the Dad bit, but don't blame yourselves for what might have caused Mini's attachment issues. None of us will ever know all the triggers. With me, it seems it's because I am the only one. So we can't win! !